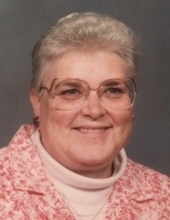 Linda Marie Russell died March 27, 2019, after a courageous battle with Alzheimer's disease. She was born September of 1942 in Baroda Michigan to Aaron and Leota (Dibble) Barker. She attended Lakeshore High school, graduating in 1960. Linda married and raised two children. She began a career with the American Automobile Association in the mid 1970s and retired in 2000. Linda then worked for Harding's Friendly Market in Bridgman until her final retirement in 2010. Linda was preceded in death by her parents and siblings: Ernest and Glen Barker and Mary Jo (Barker) Salinas. Linda is survived by her son, William Russell; daughter, Kimberly (Jon) Kaltz; brother, Gary Barker; two grandchildren, Ryan and Stephanie Kaltz; and several nieces and nephews. Linda's family will celebrate her life privately. To send flowers or a remembrance gift to the family of Linda Marie Russell, please visit our Tribute Store. "Email Address" would like to share the life celebration of Linda Marie Russell. Click on the "link" to go to share a favorite memory or leave a condolence message for the family.